Content Marketing World is closer than you might think and there are so many items to plan for before jet setting to Cleveland in September. Are your bags and business cards packed? Got snacks and supplies for the flight? Uploaded a new oh-so-dapper Twitter photo? And what about picking a track, and some favorite speakers? To help you prepare for the what you’ll learn (or give you some helpful insights if you’re unable to attend), TopRank Marketing and Content Marketing Institute have partnered to bring you insights from 14 of our most talented “content crew members” that will be speaking at this years conference. Well, according to the latest joint CMI and MarketingProfs research, a full 89% of B2B marketers, and 86% of B2C marketers utilize content marketing. So does that mean that we can finally kick back, and flip on autopilot? Not even close. The same study we found that 59% of B2B marketers say it’s unclear what successful or effective content marketing looks like at their organization, while just 52% of B2C marketers agree that leadership gives ample time to produce content marketing results. 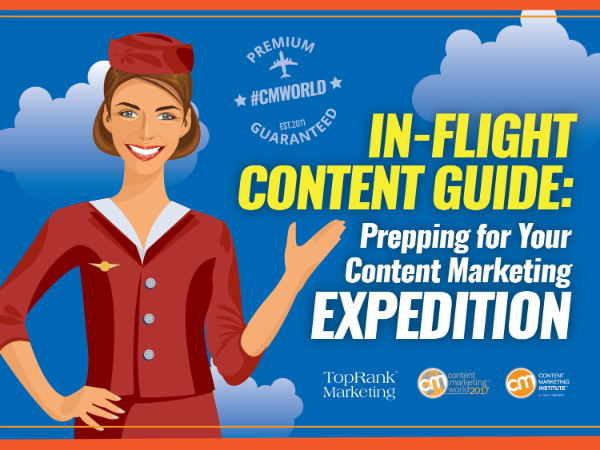 So, fasten your seatbelts, and prepare for the wildest of content rides with our first of three eBooks titled: In-flight Content Guide: Prepping for Your Content Marketing Expedition where our content crew shares their top tips for tackling the ever daunting content strategy! Keep your eyes peeled for the next eBook in our series, the In-Flight Content Guide: Creating a Memorable Content Experience. If you’re not attending Content Marketing World this year, don’t worry! You can still follow along and participate in conversations via Twitter by using the hashtag #CMWorld, by following CMI on Twitter or by subscribing to our blog.